A commenter recently wrote that "...Greenpeace et. al., used to tell me not to trust government science, now Greenpeace et. al., tells me I have to trust big government." Which is not true; it's just that's where they see a solution to the carbon problem. Meanwhile, conservatives have refused to offer a solution that conforms to their political philosphies. Cap-and-Trade, of course, was once such a solution -- it was once a conservative proposal, which they considered to be market-based, and they implemented itto control US sulfur emissions. But the right in the US has gotten even more extreme since then (which makes you wonder if we'd still have an ozone layer if the ozone problem was found in the last few years), and instead of offering a solution to the carbon problem they choose to vacate the playing field and deny that the game is even on. A few months ago I wrote an article for Physics World on light field cameras such as those now being sold by Lytro and Raytrix. Within perhaps 10 years, I suspect, this technology will be standard in all cameras. The leaders of the experimental group OPERA that announced the faster-than-light neutrinos have stepped down after a vote of no confidence. Ouch. You probably heard that the anomalous result was likely due to a bad cable connection. Some collaboration members believe that the results, when first announced at a symposium at CERN on 23 September 2011, should have been presented more clearly as preliminary. They are also unhappy that more experimental checks weren't carried out before the announcement. "Once the seminar was done, OPERA should have undertaken a more extensive campaign of tests before submitting its paper to a journal," says Luca Stanco, leader of a group from the University of Padova in Italy, "including the famous cable test. Technical errors can happen to any collaboration. But we should have been more careful." Think Robert Bryce will correct his WSJ op-ed? No, I don't either. Consensus does matter in science. It isn't always right, but it usually is -- enough that you'd lose a lot of money if you continually bet against it. Canada will take their penny out of circulation at the end of this year*. It costs 1.6 pennies to make each penny, so the move will save taxpayers C$11 million per year. But I don't suspect that was the real reason -- it's just inefficient for businesses, banks, and people. Like all other reasonable and productive Canadian ideas, the US will ignore this, keep their own penny, and lumber on as if this were still 1950. * Payments to the nearest penny can still be made digitally, though. Retailers who accept cash are supposed to round to the nearest C$0.05. As there's been no action since then, we're officially sunk, in the eyes of the IPCC, or at least its Chairman. This is a good reason not to make categorical statements, especially if you're in charge of something. Even if your intentions are good. 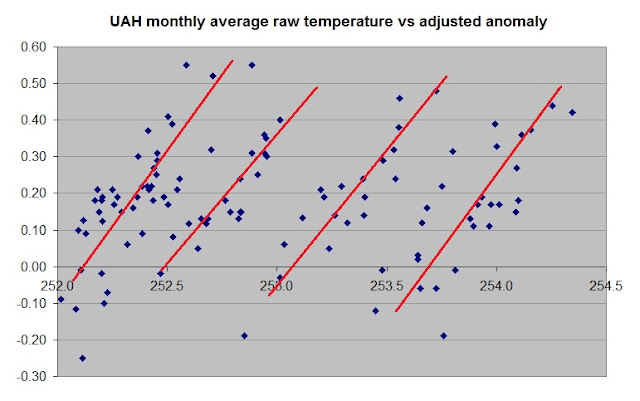 I was going to write about this month's raw satellite temperature measurements for the lower troposphere from UAH, and "predict" what the final anomaly for March would be. But I thought I'd better check something first. 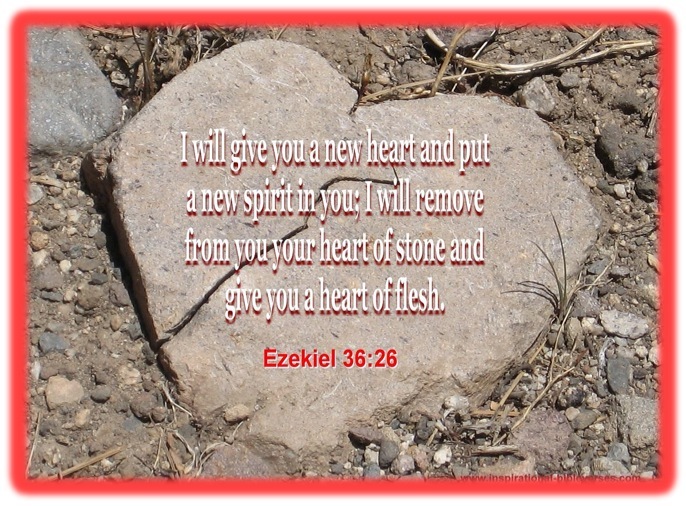 Be sure to read this post by Roy Spencer, which explains some of the complications. San Francisco, CA – General Motors has announced that they will discontinue funding from the climate change-denying Heartland Institute. The decision came in response to a national campaign coordinated by Forecast the Facts, through which more than 20,000 people, including 10,000 GM owners, called on GM to pull their support. GM's funding of Heartland came to light in February via leaked documents that also revealed Heartland's plan to insert climate change denial into public education. GM announced their decision to Greg Dalton, the director of Climate One, a discussion series at San Francisco's Commonwealth Club, who posted the information on his blog: http://climate-one.org/node/947 Three weeks earlier, GM CEO Dan Akerson spoke at a Climate One event, and in response to a question from Mr. Dalton announced that he would personally review the Heartland funding. "We applaud GM's decision and the message it sends: that it is no longer acceptable for corporations to promote the denial of climate change, and that support for an organization like Heartland is not in line with GM's values. This victory belongs to the 20,000 Americans, including 10,000 GM owners, who demanded that GM put its money where its mouth is on climate change and sustainability." A new study suggests it's not Republican's brains after all. An article by Gordon Gauchat in American Sociological Review finds that in the mid-1970s self-identified conservatives had the highest trust in science, relative to self-identified moderates and liberals, and in 2010 had the lowest. Do you suppose human genetics changed much in 35 years? No, I don't either. The mutation rate of the human genome is about 1 nucleotide in 91,000,000 per generation. And I’ll examine what is in some ways the most revolutionary idea at all–the increasingly powerful notion that, while the environment assuredly matters, much of the left-right difference may ultimately be influenced by genetics, and even detectable in structures in the brains. The emphasis is Keith Kloor's, which I'll second. In other words, Mooney's book, and much of his work, is a perverse attempt to twist science purely for political purposes. And this was fairly clear, even before this study. And that is at least as bad as claims about denying science, and many would say it's even worse. I certainly would. I started reading Will Happer's recent piece in the WSJ -- the man should be a farmer, becasue he is quite the cherry picker! "What is happening to global temperatures in reality? The answer is: almost nothing for more than 10 years. Monthly values of the global temperature anomaly of the lower atmosphere, compiled at the University of Alabama from NASA satellite data, can be found at the website http://www.drroyspencer.com/latest-global-temperatures/. 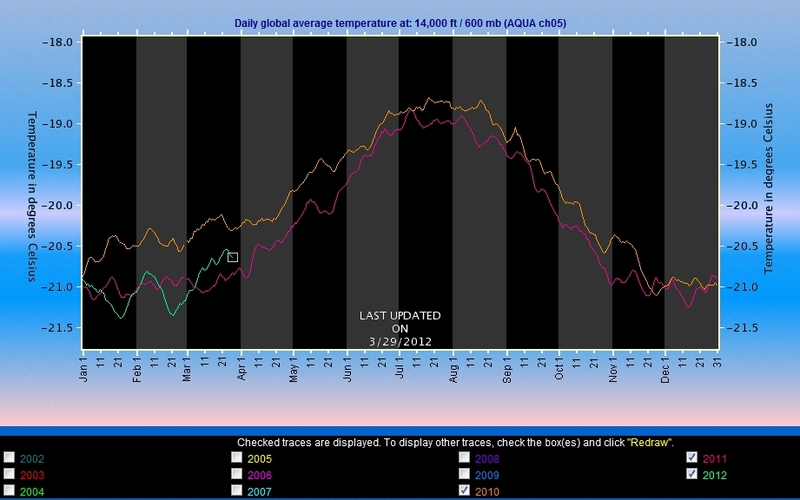 The latest (February 2012) monthly global temperature anomaly for the lower atmosphere was minus 0.12 degrees Celsius, slightly less than the average since the satellite record of temperatures began in 1979. "The lack of any statistically significant warming for over a decade has made it more difficult for the United Nations Intergovernmental Panel on Climate Change (IPCC) and its supporters to demonize the atmospheric gas CO2 which is released when fossil fuels are burned." I notice Happer's bio at the end of the article doesn't say that he's the Chairman of the Board of Directors of the George C. Marshall Institute, and an Academic Advisory to The Global Warming Policy Foundation. I wonder (in the interest of full disclosure, of course) what those positions pay, and where that money comes from. So what is the natural rate of temperature extremes? Here's what I was thinking about the chances of finding extreme weather events somewhere on Earth, in the absence of climate change, though I don't have it all figured out. I'll use some simple math because it makes it easier to think. Let E be the Earth's surface area (510 million km2), and divide the surface into regions all of area A. The number of such regions on the planet is E/A. Let D be the length, in days, of your daily temperature measurements. In D days the number of measurements for the entire planet is D*(E/A). We want to consider temperature fluctuations, whose length is some number of days N.
For any region, its daily "average temperature" is the average of the daily high and daily low (as meteorologists often do). The N-day average as just the average of daily average temperatures of the last N days. Subtract the mean for those days, and call this the "N-day fluctuation," as we do, and to save writing call it FN. There will be 365.25 of these fluctuations every year, for every N -- some below zero, some above zero. They have some distribution, and some chance of being more than 3 standard deviations above the mean, or 5 standard deviations below the mean, etc. where p is the probability of the fluctuation. So if you pick the size of the region and the extremeness of the fluctuation, and you know the probability distribution, you can calculate the average number of days between them. "Extreme-event statistics are challenging: extremes are by definition rare, so the tails of the probability density function are not well constrained and often cannot be assumed to be Gaussian." Excel has the erf function, so this is easy to evaluate for different values of σ. For example, p(2) = 2.3%, p(5) = 1 in 3.49 million, etc. So every 3.2 years there is going to be, somewhere on the Earth, an area 900 miles x 900 miles in size that has a heat wave 4.5 standard deviations above the mean. And one cold wave, too. In a decade there will be three of them. But, the relevant σ depends somehow on N -- obviously we have more 2-day heat waves of a given extremity than we have 7-day heat waves of the same extremity, and many more than we have 14-day heat waves, etc. I don't yet know how to incorporate this. For example, the recent US heat wave is summarized in this map from NASA (click to enlarge). It shows that a fluctuation for a certain region of 12°C for a period of 7 days. But what is the standard deviation of 7-day temperature fluctuations? It is less than the s.d. for 3-day fluctuations, and more than the s.d. for 10-day fluctuations. But what it is? And how exactly does σ depend on N? I suspect this is well known -- I just don't know enough statistics. And until then I don't see how to answer this question. Part of the selection bias is also the freedom to pick N afterward. If a 7-day fluctuation doesn't look scary enough, maybe the 6-day fluctuation does. The 5-day fluctuation might look even worse. Etc. The subtle early warning signs of global warming are beginning to be detectable in the statistics of extreme events such as droughts and episodes of heavy rainfall averaged over intervals of a few decades, but the changes reported thus far do not qualify as “dramatic” [Easterling et al., 2000; Intergovernmental Panel on Climate Change (IPCC), 2007]. The attribution of individual events—such as the current droughts in the Horn of Africa and Texas, the floods in Pakistan and Thailand, or the 2009 summer heat wave in Russia—to global warming is problematic because extreme events would occur from time to time even in an unchanging climate. Even in the presence of climate change,extreme events do not occur often enough to enable scientists to track decade-to-decade changes in their statistics in real time, as they successfully do with more aggregated quantities such as global mean temperature and sea level [Palmer and Räisänen, 2002]. "There are many types of conceivable extreme, such as for different regional entities or time periods as well as different weather parameters (some 27 indices for extremes have been proposed). To pick the type of extreme post hoc — for example, to study Pakistan rainfall extremes after a record-breaking event there — risks selection bias, that is, bias by selecting just the kind of time series that shows recent extremes. Proper statistical analysis of changes in the observed number of extremes thus requires: (1) a single, comparable type of extreme; (2) selection of time series by a priori objective criteria; and (3) sufficiently long-running high-quality data." This is important, and, I suspect, where many AGW believers like Bill McIbben start to go wrong. My mention of Anthony Watts mother was a metaphor. A literary device. Nothing more, nothing less. I don't know the first thing about his mother, and hardly that she was dead (unfortunately, so is mine). Watts obviously just saw an opening to score a point and so pretended I was slandering her and hence him, and continues to pretend that, which is childish and, in any case, not convincing. I firmly believe humans are affecting the climate, and I believe the science shows that. I believe projecting future climate change is the most difficult calculation ever attempted, and it still has a lot of uncertainties, especially the handling of clouds, aerosols, and deep ocean dynamics. Inability to calculate precisely is not a reason to brush away the problem. Climate change has become a proxy war for fights over lots of other issues. I believe that fossil fuels have great value (and, at the same time, that their pollution causes great damage), and that we need to get off them, but not at the expense of using less energy, because energy makes life better. Right now the cost of their pollution is socialized: From each according to their smokestack, to each according to their lungs. The way to get off fossil fuels and onto alternative fuels is via a massive R&D program, incentivized by a price on carbon (I'm not sure of the price -- perhaps something like Australia's -- and I'd prefer to give it all back to everyone on an equal per-capita basis) that develops alternative fuels and/or ways to remove carbon from the air or from the energy production process. Affluent people like most of us can afford to pay for some of the damage our fossil fuels cause, because we're paying anyway for its pollution, especially in higher health costs (an average of $400 per person per year, at least). Poorer people, both in the US and especially around the world, deserve the chance to have better lives via fossil fuels, if necessary, without paying the costs of their damages. Then they can use alternative fuels when the rich countries (who have put most of the carbon into today's atmosphere) step up and develop them. I believe climate scientists are honest people trying their best to do honest jobs, like almost all of us*. They're not frauds or liars or data manipulators, but they are human and some of them make the same mistakes as any other human, including me and including you. In my experience, as a class scientists are the most intellectually honest people I've ever met, and as a result in the last 400 years civilization has made nearly incomprehensible strides forward. The personal attacks some of them have been under are terrible, and will be looked back on as a shameful time in the history of science. For some reason I'm not completely sure of myself, I was very bothered by the revelation that Michael Mann was looking for an investigative journalist to investigate Steve McIntyre. Lord knows Mann has been unfairly attacked like few other scientists in history, and I have no idea what that must be like. But it bothered me. "Do I trust climate science? As a living body of intellectual inquiry exploring profoundly complex questions, yes. "Do I trust all climate scientists, research institutions, funding sources, journals and others involved in this arena to convey the full context of findings and to avoid sometimes stepping beyond the data? I wouldn’t be a journalist if I answered yes. I believe a lot of people are making immense starships of money off fossil fuels, and as a result denigrate the science or spread money around to assist others do that. The U.S. isn't moving forward on lots of problems, including climate change, because large corporations buy our politicians. In relation to its size, power, and reach, the U.S. may be the most corrupt nation in the history of the world. I don't really believe people who say we should be concerned about the people of the future when so many of us accept and tolerate the great poverty being experienced around the world by billions of people who are alive today. I work hard to inform my opinion, as do lots of others, and change it when I find good reasons to have a different one. I don't ban people from my blogs without a very, very good reason, which is that they've continually stepped way over the rudeness line. (Doing so while remaining anonymous is especially cowardly, in my opinion.) I've only done it 2 or 3 times, and I can't ban people since going on Blogger since it doesn't have that functionality. I don't even moderate comments, except those over 7-days old, and that's only to prevent spam. Some commenter, probably from Watts' site, still owes me $10. My email address is on the right. * Except Joe Bastardi, who is either scientifically incompetent or intentionally dishonest -- I can't figure out which. Until there is more evidence I will default to the former. 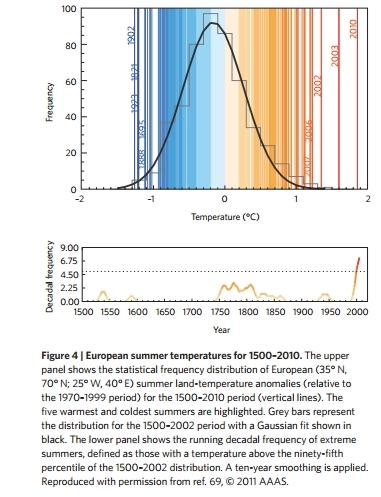 I've read most of the new paper by Coumou and Rahmstorf in Nature Climate Change ("A decade of weather extremes"), and it's very interesting but doesn't really address what I thought it would. It has a lot of interesting numbers and references to papers that have studied extremes in various locales. But it seems to me you can always find extremes somewhere on the planet (more on that in my next post). "For some types of extreme, there are simple physical reasons why they would increase in a warming climate. If the average temperature rises, then obviously so will the number of heat records, all else remaining equal. Cold extremes will decrease, but if the probability distribution for temperature is shifted unchanged towards warmer conditions, the total number of extremes (hot plus cold) will increase. That is fundamentally because what is considered extreme is always based on past experience, and a change in climate moves us out of the familiar range. "Warming will lead to more evaporation, too, and thus surface drying, increasing the intensity and duration of drought. Warmer air can also be expected to enhance precipitation extremes as it can hold more moisture. According to the Clausius–Clapeyron equation, for each 1 °C of warming, saturated air contains 7% more water vapour, which may rain out if conditions are right. Increased atmospheric moisture content also provides more latent energy to drive storms. Furthermore, the potential intensity of tropical storms increases with warmer sea surface temperatures, all else remaining equal. "Such simple physical considerations thus lead us to expect certain weather extremes to increase in a warmer world. However, they are not sufficient to make firm predictions, because all else may not remain equal and a more detailed analysis is needed. First of all, to detect whether extremes have in fact increased, statistical analysis is required. For an attribution of extremes to a physical cause, modelling approaches can be used." "Recent years have seen an exceptionally large number of recordbreaking and destructive heatwaves in many parts of the world. Several recent studies indicate that many, possibly most, of these heatwaves would not have occurred without global warming. "In 2003, Europe suffered its hottest summer by far for at least 500 years, with temperatures in Switzerland topping the previous record by a full 2.4 °C, equivalent to 5.4 standard deviations. Greece experienced its hottest summer in 2007, with summer temperatures in Athens exceeding the 1961–1990 mean by 3.3 °C, corresponding to 3.7 standard deviations. Australia’s worst bush fires on record, following an unprecedented heatwave, ravaged the country on the ‘Black Saturday’ of February 2009 (ref. 34). In 2010, central Russia suffered its worst heatwave since records began, with the July temperature in Moscow beating the previous record by 2.5 °C (ref. 5). Finally, in July 2011, the US Southern Plains were hit by a record-breaking heatwave. "Several recent statistical studies show that the number of heat extremes is indeed strongly increasing. Starting with daily data, a recent study with global coverage shows a widespread (73% of land area) signififcant increase in the occurrence of warm nights (warmest 10% of nights)during 1951–2003. At present, about twice as many record hot days as record cold days are being observed both in the United States and Australia. Similarly, for Europe nearly 30% of the observed daily heat records are attributable to the warming climate. The length of summer heatwaves over western Europe has almost doubled and the frequency of hot days has almost tripled over the period from 1880 to 2005 (ref. 37). In the eastern Mediterranean, the intensity, length and number of heatwaves have increased by a factor of six to eight since the 1960s (ref. 38)." So just in time a new paper has come out that finds an increasing trend in extreme weather events. I haven't read it yet and it's late now -- will take this up tomorrow. But New Hampshire did have a lot of variation, and it's much more representative of where this recent heat wave took place. If you're interested in weather you can't do much better than New England, which just about has it all. The Lake Winnipesaukee ice-out record starts in 1880 and the ice-out date has been moving forward for decades, as shown on the right. Anyway.... I looked at my weather records for Gilford, NH, which spans 4.7 years. Incidentally, the normal annual range (difference between the warmest normal day and coldest normal day) is 50.0°F in New Hampshire, but only 28.5°F in Oregon. That number, 23,000 years, still looks unbelievable, but it looks much less unbelievable than my earlier number. (But in this case "less unbelievable" doesn't necessarily mean "more believable.") Anyway, this analysis is probably all crap and someone who knows what they're doing surely has better answers, and I've likely just wasted my time (and yours--sorry). Some people think I was unfair to Bill McKibben the other day. I think perhaps I was, somewhat, but I can't go all the way from "McFibben" to "McKibben." But I can go to "McIibben." So how bad was the recent U.S. heat wave? On the right is a figure from NASA, via Climate Central. A 12°C (22°F) anomaly over 7 days certainly sounds bad. Is it? I've kept records of the weather in Scappose, Oregon, down the road from me, for the last 3.5 years, via this NOAA site. Like they do, I take the average daily temperature to be the average of the day's high and the day's low. From here on I'll convert to Celsius, so as to compare with the map above. Over the course of my record keeping, I calculated the average for each 7-day period (rolling), and compared it to the normal. I took the absolute value to get a deviation regardless of sign. The average 7-day absolute deviation was 1.72°C, with a standard deviation of 1.43°C. The maximum 7-day deviation was 9.64°C -- that was a cold snap in December 2009 where we had two consecutive nights where it got down to 8°F, with daytime highs both days of 31°F. The pipes running through the attic from my water heater to the bathroom broke, and my landlords had to replace the pipes, redo part of the bathroom ceiling, and replace several square yards of carpeting. I lost a few papers that were on the floor and a bowl of kibble. So even in this 3.5 year period I had a 7-day deviation of nearly 10°C, almost like the heat wave in the NASA map above. That was probably an unusual cold snap for here -- the plumber said pipes were breaking all over town. But even in 2011, the maximum 7-day deviation was 6.11°C (a warm spell last August). Given my average and standard deviation, how unusual would a 7-day heat (or cold) wave of 12°C be? It'd be very unusual: 7.2 standard deviations above the mean. Assuming its a Gaussian distribution, the chances of that occurring are about 3 x 10-13. Since every day you get a new 7-day interval, this means a 7-day heat/cold wave with a ±12°C anomaly would occur, on average, every 52 billion years. That's surely too high, probably because my record is very short -- only 3.5 years long. But clearly such a heat wave is very rare. So it was partly fair for McKibben to highlight it, although if you'll notice, there is also a very large deep purple spot on the map above. At the very same time as the USA48 heat wave. So 52 billion years is surely far too large. On the other hand, who's going to complain about a big heat wave in March? I'm sure almost everyone was saying, if this is global warming, give me more of it! The eastern European cold snap claimed hundreds of lives. Here is saved a lot of people money on heating and salved their cabin fever. OK, you say, what if it had occurred in July? Well, it didn't, and anyway July is only 1/12th of the year (OK, August is another 12th). Heat waves happen. As Mike Hulme writes in you know where, in 1976 there was a heat wave in France that caused about 6,000 excess deaths that "passed completely unnoticed and the death count was only revealed by later retrospective analysis." Are we really going to rebuild all of civilization to avoid the occasional heat wave and rising seas and some slightly stronger hurricanes? I was thinking about this last night, and the answer is clearly no. Yes, these aren't the only impacts of climate change, by any means, but we get a lot of value from burning fossil fuels. A lot. There is as yet no viable substitute for them. I was thinking about my personal list of concerns, the big ones, and the honest answer is climate change is pretty far down the list, after health care, income (and so, the economy), clean local air and water, crime, and then things like war and terrorism and then hungry and poor people across the globe and animal suffering and probably a few things that aren't occurring to me now, and then climate change. Sorry, but that's the truth. So partial apologies to Bill McIibben. But I can't go all the way to "K," because he still picks and chooses his weather events, and because he completely ignored the main finding of the recent Swart and Weaver article on the Canadian tar sands causing only 0.03°C of warming. True to form, he took it as more proof of his position. Bill McKFibben went on Democracy Now today to talk about the President's attempt to make everyone happy on the Keystone Pipeline (or, at least, make everyone equally unhappy), and mentioned the warm weather in the US, calling it the "weirdest weather ever seen in this country." Personally I find such talk strange, since here in Oregon it's been cold and rainy (and even snowed last night), but that's another matter. But weirdest weather ever? Weirder than the Dust Bowl years? Than any of various "storms of the century," or 1972's Hurricane Agnes, a June hurricane that swept away all our lawn furniture and precipitated a 20-year feud between my grandmother and my great uncle-in-law when she suggested, as we were standing around watching the water come up, that he'd better get his Volkswagen Bug out of our driveway before it floated away. (I suspect there must have been bad feelings between them already, and this was just the last straw.) Me, I believe the absolutely weirdest weather in the U.S. occurred on August 25, 1814, when, just as the British were setting fire to Washington D.C. -- the Americans having all fled the day before, including Dolley Madison with some valuable paintings -- a hurricane appeared out of the blue and put out the fires, saving the city and, quite possibly, the nation. Anyway it's certainly been a warm March in the U.S., but conveniently McKibben doesn't mention that the rest of the globe has had a fairly cold winter (Dec-Feb). Globally, UAH measured the lower troposphere to rank 19th out of 34 years; the USA48 ranking was 4th (last year it was 26th). UAH's trend for USA48 over their 34-year record is 0.21 ± 0.04 C/decade. That's worrisome enough, and it what really he ought to cite, but I guess it's not scary enough and he needs to take advantage of a heat wave while its here. "Last year was the warmest ever recorded on planet Earth. Arctic sea ice is near all-time record lows. Record floods from Pakistan to Queensland to the Mississippi basin; record drought from the steppes of Russia to the plains of Texas. Just about the only trauma we haven’t had are hurricanes plowing into the U.S., but that’s just luck—last year was a big storm year, but they all veered out to sea. This year we’re already on letter I—which in a normal year we don’t get to until well into October." This is cool, not because of any relation to global warming, just that how often do you see such a thing? In the service of the oil and gas industry, Pennsylvania recently passed a law that gags doctors from discussing certain health concerns related to fracking. Really. In particular, the bill (House Bill No. 1950) requires that companies disclose information about chemicals that a health professional suspects may be related to a patient's problems, but if those chemicals are claimed to be a trade secret the doctor may not use that information outside the context of treating the specific patient, and the doctor must keep that information confidential. That means, if a doctor suspects a fracking chemical or procedure is making a specific patient ill, he or she may not make that widely known, including, apparently, to the patient. How sick is that? (11) If a health professional determines that a medical emergency exists and the specific identity and amount of any chemicals claimed to be a trade secret or confidential proprietary information are necessary for emergency treatment, the vendor, service provider or operator shall immediately disclose the information to the health professional upon a verbal acknowledgment by the health professional that the information may not be used for purposes other than the health needs asserted and that the health professional shall maintain the information as confidential. The vendor, service provider or operator may request, and the health professional shall provide upon request, a written statement of need and a confidentiality agreement from the health professional as soon as circumstances permit, in conformance with regulations promulgated under this chapter. Ecowatch has much more. For example, companies that frack do not have to disclose what chemicals or procedures they use (except in the case of medical emergencies in the context above). I'm somewhat speechless. It's rare you see such such an official disregard for people's health made so explicit, or corporate favoritism made so stark. All eight scientists in Tennessee who are members of the National Academy of Sciences have signed a statement expressing their opposition to what have become known as "monkey bills" -- legislation that would encourage teachers to present the "scientific strengths and scientific weaknesses" of "controversial" topics such as "biological evolution, the chemical origins of life, global warming, and human cloning." "These bills misdescribe evolution as scientifically controversial. As scientists whose research involves and is based upon evolution, we affirm -- along with the nation’s leading scientific organizations, including the American Association for the Advancement of Science and the National Academy of Sciences -- that evolution is a central, unifying, and accepted area of science. The evidence for evolution is overwhelming; there is no scientific evidence for its supposed rivals ("creation science" and "intelligent design") and there is no scientific evidence against it." If the evidence is "overwhelming" it should be a simple and straightforward lesson, right? Teachers could point out what that evidence is and why it's overwhelming, and what is lacking in other explanations. Sometimes I think the real problem is that too many science teachers aren't qualified and don't themselves know the evidence for what they're teaching, and might actually have to do some research on things they can't copy out of a state-approved syllabus. For example, a 2008 study found that, nationwide, 77% of science teachers (grades 7-12) had majored in their subject; for math teachers it was only 61%. In Tennessee, just 58% of science teachers had majored in the science subject they taught, one of the lowest proportions in any state. You want kids to get the evidence for and against manmade climate change? Then show it, and show why alternative explanations fail to explain recent warming. Do the same for evolution and "God" and everything else. And then when administrators and their parents come in to complain, show it to them, too. The March issue of Physics World is free to download. I have a feature article in it on the Japanese geologist Kei Hirose and his work investigating the properties of the deep Earth at ultra-high pressures and temperatures.... Some of the other articles are on earthquake forecasting, geoneutrinos as a probe, connections between a reversed magnetic field and plate tectonics, and fracking. UCAR, 2009: Record High Temperatures Far Outpace Record Lows Across U.S.
Stay tuned to this blog for further information. The paper says "since 1950, winter temperatures in Canada have increased by more than 2.5 C, more than three times the globally averaged warming attributed to anthropogenic global warming." The authors then analyzed the starting date and season length of outdoor rinks since 1950 in six different regions of Canada, being sure to fancy up their analysis by presenting their results as anomalies so that no nonscientists could read their paper and simply learn the answer to the perfectly natural question "so how long has the skating season shortened?" "In the most extreme case of the Southwest Canada region, a simple linear extrapolation of the OSS length trend from the last 30 yr of our record into the future shows that the number of viable rink-flooding days could reach zero by mid-century. In the absence of efforts to maintain artificially cooled outdoor rinks, this result implies a foreseeable end to outdoor skating in this region within the next few decades. While other Canadian regions have not seen such dramatic decreases, we nevertheless expect outdoor skating throughout Canada to be significantly negatively affected in the coming decades by continued anthropogenic global warming. "The ability to skate and play hockey outdoors is a critical component of Canadian identity and culture. Wayne Gretzky learned to skate on a backyard skating rink; our results imply that such opportunities may not available to future generations of Canadian children." Note added: The first commenter ("sylas") on my last post makes a very important point: this isn't the "climate sensitivity" I've calculated, because that technical term means after equilibrium has been reached, which, of course, is not the case -- more warming is "in the pipeline," as they say. (And it is a looooooong pipeline.) It's more the "transient climate response," and would be a lower bound on the climate sensitivity -- which, as he writes, you can't calculate from the data. Read his entire comment for more. which, of course, is just what you expect. 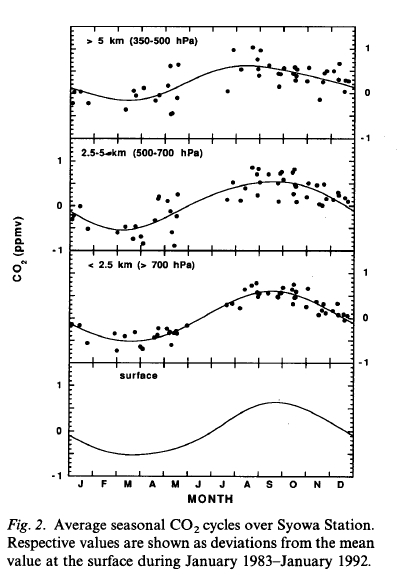 The constant "a" can be calculated by linear regression of ln(C/C0) versus time, and using the NOAA CO2 Mauna Loa data I find D = 166.0 years. The exponential assumption is a very good one (as Keeling discovered, of course,), since the Pearson correlation coefficient is R2 = 0.9914. You can calculate the statistical uncertainty too, since you know both of these from the data, which I'll do sometime soon. Sure, nobody likes to see $4.00/gallon gas, but the fact is we're only spending a little more now than in the past decade, compared to the size of the economy. Of course, an additional 0.4% of GDP is about $63 billion per year, which isn't peanuts -- it's about $200 per person (per-capita, not per driver.) The US now spends about $1330 per-capita on gasoline. Kerry Emanuel of MIT: "Utter rubbish. Sorry to be so direct, but that is just the case." Gavin Schmidt, NASA climatologist: "Bastardi is attempting to throw out 150 years of physics." 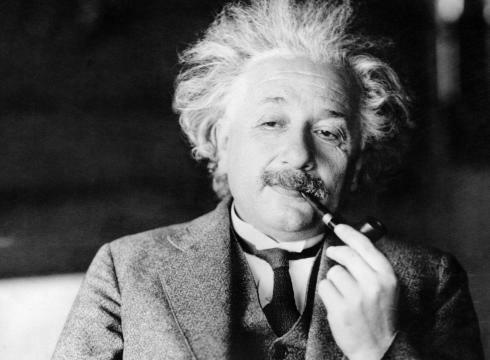 Richard Muller, Berkeley physicist: "He seems very confused." In fact, scientists have measured the distribution in the atmosphere, as William Connolley noted recently on WUWT. 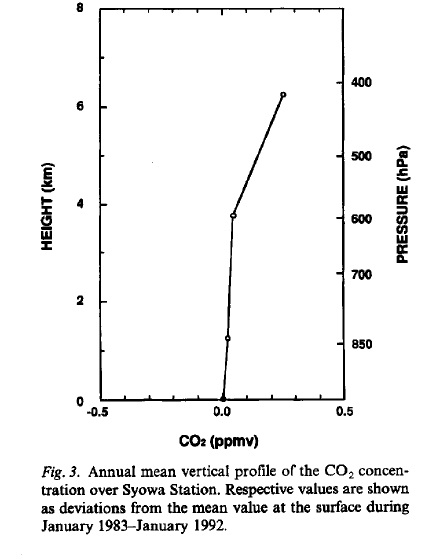 Here are some measurement, made over Antarctica (where there are no strong CO2 sources or sinks), from a 1995 paper in Tellus. These plots represent the kind of hard, thankless work scientists do to establish what we know -- a result that isn't terribly surprising, either, because you can just measure CO2 levels atop mountains and at sea level and compare (though local CO2 sources might slightly affect the results), something that is done around the world. It involved planning an expedition to Antarctica, with all that entails, and flying instruments in planes, which sounds simple but was surely beset by cold and wind and snow and frozen fingers and teared-up eyes and finicky instruments and pilots blinded by the sun as they tried to fly an exact heading at an exact altitude. Nor is this the only such experiment -- the paper lists others in its References. And then, after all that hard, careful work, some...creep...goes on television and shamelessly tells the whole world the exact opposite. Now that is a useful idiot. Or a useful liar. Or maybe both. Iowa just enacted a law that bans anyone from posing as an employee to gather information about animal cruelty. Not only does that seem to violate the First Amendment, it would have banned the research that lead to one of the 20th century's great American novels: The Jungle by Upton Sinclair. In 1904 Sinclair went undercover and spent seven weeks working in the meatpacking plants of the Chicago stockyards, gathering information for a magazine article he later expanded into a book. Nor is this the only attempt to criminalize inconvenient speech, such as by labeling it terrorism. 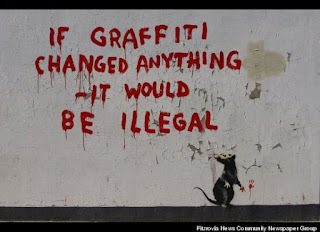 As a result, any act aimed to intimidate an individual or corporation that has a political or social goal qualifies. On exactly these same grounds those who participated in the Boston Tea Party, or simply encouraged it, would be charged as terrorists. You really can't let them get their nose under the tent -- all slopes are slippery. All of them. Plus, that's a nice hat. Did you know that if the Republicans win the majority of US Senate seats in November -- which looks quite possible, since 21 of the seats up for reelection are held by Democrats and only 10 by Republicans -- that James Inhofe will be the Chairman of the Senate Committee on the Environment? In other words, Inhofe -- who just said it was an "outrageous" idea that "human beings, would be able to change what [God] is doing in the climate...." would hold the position that is perhaps the biggest determinant of the future climate of the planet. Now if that's not a hoax on God's part, I don't know what is. The Statistical Abstract has been discontinued due to budget constraints. "The U.S. Census Bureau is terminating the collection of data for the Statistical Compendia program effective October 1, 2011. The Statistical Compendium program is comprised of the Statistical Abstract of the United States and its supplemental products - - the State and Metropolitan Area Data Book and the County and City Data Book. In preparation for the Fiscal Year 2012 (FY 2012) budget, the Census Bureau did a comprehensive review of a number of programs and had to make difficult proposals to terminate and reduce a number of existing programs in order to acquire funds for higher priority programs. The decision to propose the elimination of this program was not made lightly. To access the most current data, please refer to the organizations cited in the source notes for each table of the Statistical Abstract." Last summer I thought this was an unwise move, penny-wise and pound-foolish, and while I still think it would be money well spent -- the cost was only $2.9 M/yr, or less than 4 soldier-years in Iraq, per year -- it's not a disaster. I have been noticing lately how easy it has become to get meaningful data from other US government agencies, such as the Departments of Labor, Commerce, Transportation, the EIA, the Federal Reserve, and the Census Bureau (at least). They have decades of well-organized data you can download right into a spreadsheet, interactive plotting, etc. It's similar with climate data from NOAA, NASA, etc -- you can keep up with the latest monthly (sometimes weekly) data on dozens of quantities, and essentially become an amateur climatologist (one thing I think is fueling the climate debate, as people [including me] read too much into every monthly up or down). These agencies are doing great jobs at making their data timely and accessible, and I expect this will only increase over this decade as documents, books, and sites become alive and carry tables and charts that are automatically updated with new data is available or old data is revised. It's becoming increasingly difficult to remember how anyone got by before the Web was invented. I was telling my nephew that I grew up before anyone had computers in their homes, and I felt like a dinosaur. He doesn't even understand that you used to have to wait for a television program to come on at a certain day and time before you could watch it, instead of just calling it up from the DVR. A recent report from the UK finds that those with poor numeracy skills earn 21% less than the numerate.... But my question is: How could this statistic possibly convince an innumerate person they need to improve their abilities with numbers (if you get my drift...)?